Giving special things to your guy is wonderful. Guy gifts can be as romantic as one perfect flower or as spontaneous as a batch of freshly baked choc o'chips. 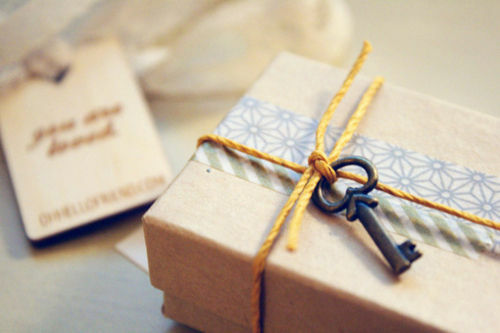 But every gift comes with an invisible message-one that says something about the way the giver cares. Find out how good you are at the language of gifts with this quiz. 1. You know hes broke. But it is Christmas. Whats the right thing to do? Agree to exchange kisses and hugs. Rewrap "loser" gifts you received and give them to him. Give him a hefty gift certificate for Victorias Secret. make him look at all your baby photos, then promise to copy "one" for him. buy him a king-size pair of baby booties. arrange to visit your cousins newborn so he can get in some cuddle time. 3. He made the team! How would you celebrate? Give him a framed photograph of him in uniform. buy him a copy of The Bad News Bears for "inspiration". Buy yourself a team jacket. a book about antique Asian hand tools-written in Japanese? a surprise party for two with all his faves. a photo album with head shots of you. a list of the things you want him to do for you. a small handmade heart-shaped pillow with your initials. 7. Hes often told you hed rather have a root canal than a surprise party. But his best bud is planning one for him. What to do? Meet him at the party. Tell his bud the thought is great, but not to do it. Arrange to bring your crush yourself-after all, you have got a hot new party outfit. a hand-knit scarf in his favorite color. wool, needles, and a knitting booklet. your mothers old hand-knit Norwegian sweater. your family dog to baby-sit. order another on eBay and have the bill sent to him. tell him he can listen to yours. try to buy it at the sale for him.